Christmas is my favorite time of they year. I love the smells, the colors, but most importantly the feeling. 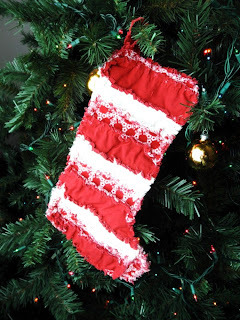 I love to sew and this year I decided to sit down and create my baby her very own stocking. 2. Now take each strip of fabric and place sandwich 2 on top of each other with wrong sides together. So now you will have 24 fabric sandwiches. 3. Take 2 of the sandwiches and place them together. Sew down the long side of the fabric sandwich. 4. Repeat with 10 more fabric sandwiches. 5. You will now have a rectangular piece of fabric. 7. Lay your 2 rectangles on top of each other with wrong sides together. 9. Cut out a piece of fabric that measures 4 inches by 1 inch. This will be the hoop to hang your stocking up with. 11. 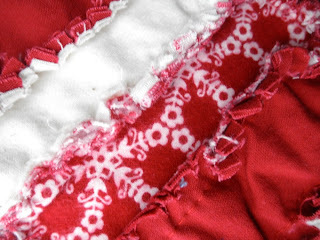 Sew down both long edges of the piece of fabric. 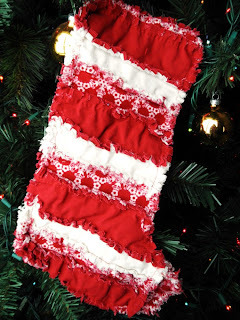 Stick the short ends of the piece of fabric in between the sandwiched fabric at the top of the stocking. 12. Sew around the top of the stocking. You will be sewing 2 layers of fabric together. 13. Now take some short blade scissors and cut all the raw edges of your stocking. 14. Wash and dry the stocking. I made a rag quilt for my unborn granddaughter, but never thought about making a stocking! I love this idea...that's for the inspiration! I also love your 'countdown to Christmas' quilt too! I'm going to do that next year with my grandson!! !